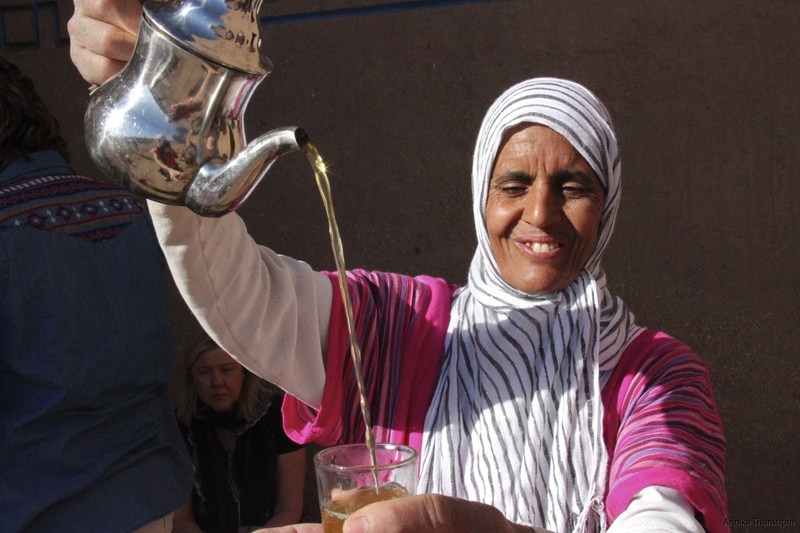 Personal, value for money, Morocco travel experiences. Customized or in a group. 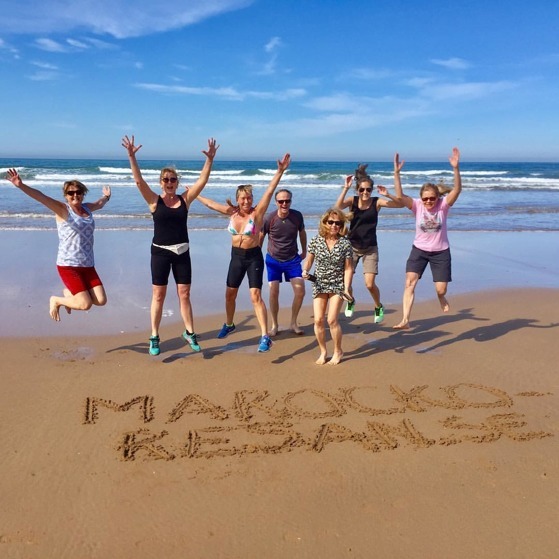 Marrakech, Sahara, Essaouira, and the Atlas Mountains! Sea view from Marockoresans favourite riad in Essaouira. Let us arrange your own, unique trip to Morocco – a road trip to the Sahara, a trek in the Atlas Mountains, or simply the perfect riad and a city tour in Marrakech. We can customize your trip according to your tastes. Our hand-picked guides will translate and explain every little thing that might seem puzzling. As your door-openers they will make your trip unforgettable! In Marrakech and Essaouira, finding a riad/hotell that perfectly suits your needs and your wallet is no easy task. Marockoresan can do this for you – and it is our ambition that it should cost no more than if you did it yourself. Let us arrange your trip to Morocco: The Sahara Desert, the Atlas Mountains, Essaouira or a riad in Marrakech. 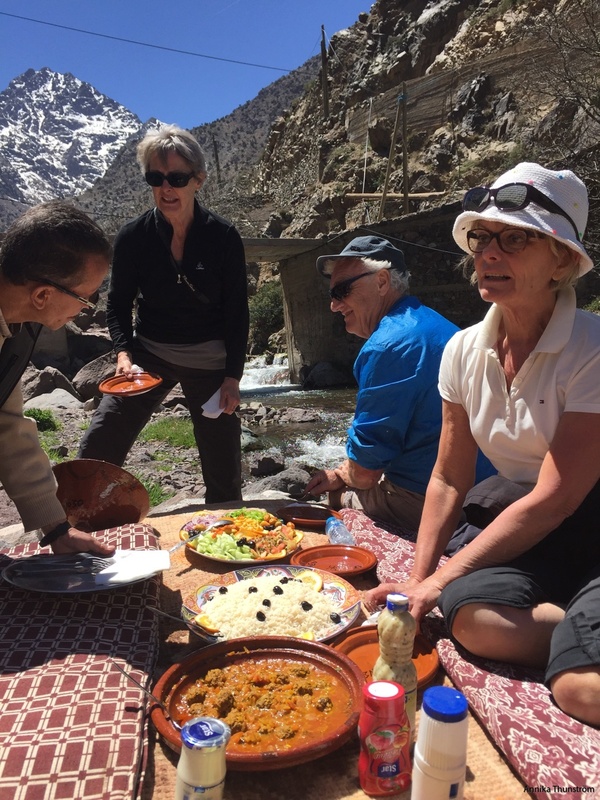 To get the most out of your trip we can recommend our Marrakech-Atlas Mountains-Essaouira combination tours. 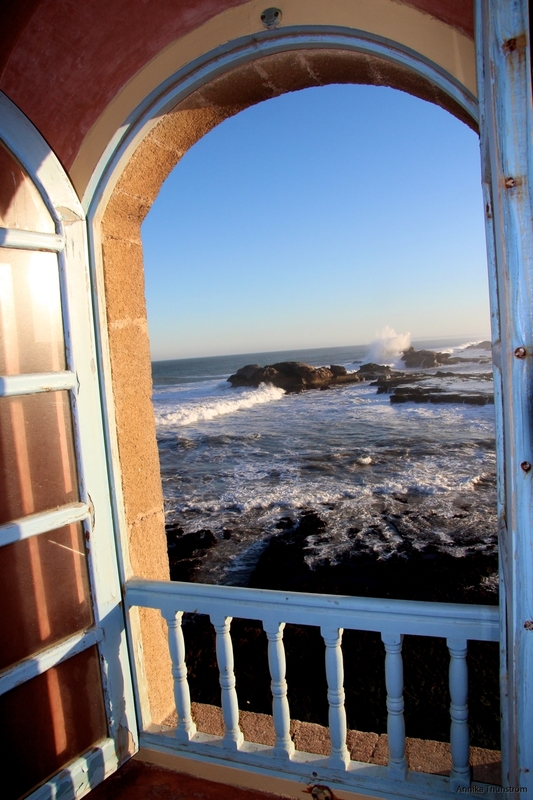 During almost all the winter you will find us on the ground in Essaouira where we can give you some hints on the best spots and secret hideaways in the city. Marrakech. Essaouira. Atlas Mountains. Sahara. Where do you want to go? We love Morocco and we want you to do the same! 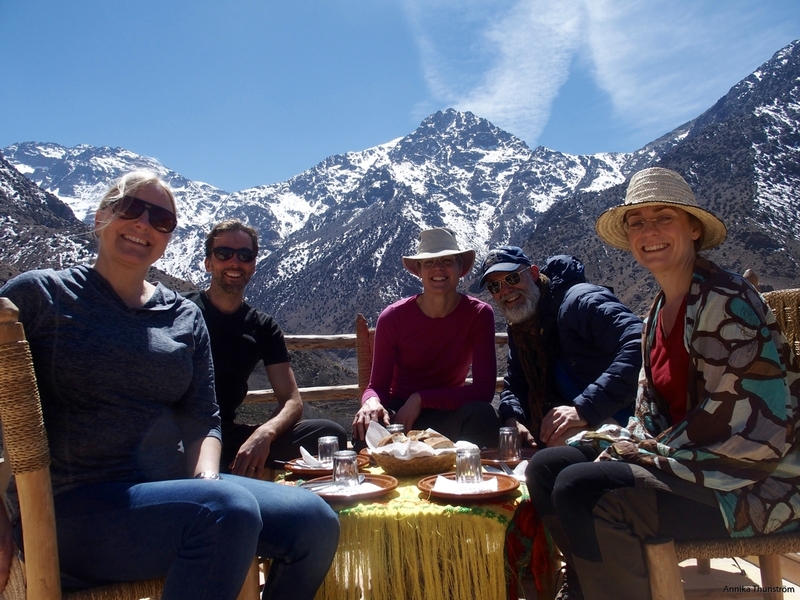 We arrange unforgettable experiences where you can expect to meet the hospitable locals and to see the genuine Morocco. This personal, value for money experience is only a few hours of air travel away! This is photo op country! Marockoresan takes you on scenic treks in the Atlas Mountains. This is close to Imlil. 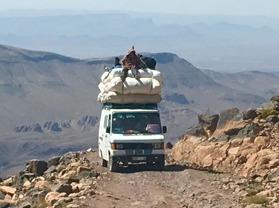 Morocco is an endlessly beautiful and exciting country, as from mainstream as you can get. There seems to be more of everything: Magnificent and varied nature. Intense colors. Hectic. Restful. Blooming and luscious. Arid and rocky. Cold. Hot. Accprding to Australian Sunday Morning Herald Morocco is the best place in the world for taking photos: People, villages, alleys, nature, sunsets, food. The light and the colours are exceptional, from the spice market in the souk to the mud-colored villages in the desert, to the Bedouins always dressed in blue. In Morocco with a camera you can’t go wrong! See for yourself here on marockoresan.se. I, Annika Thunström, have taken all the pictures myself when visiting this breathtaking country. "After the trip I am a better person. A part of my soul is still travelling..."
Our earlier partner at Marockoresan, Khalid Lamlih, was top of the list World Guide Award 2017 according to travel magazine Wanderlust. 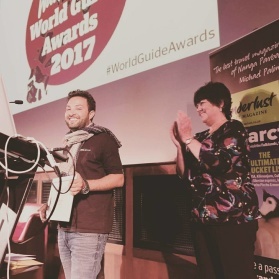 Last year he was awarded "Guide of the Year 2016" by the adventure travel company PEAK. Khalid is a true GUIDE who takes pride in letting his guests meet people (rather than taking them to shops and getting a commission…). He loves showing off his country beyond the travelled path. And he certainly knows how to spellbind his listeners with his many stories. 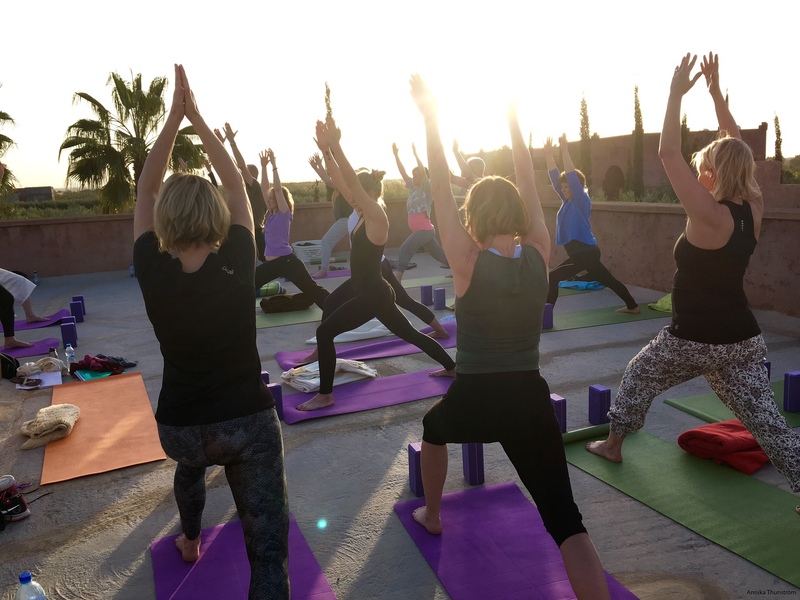 From 17 to 22 march 2018 Marockoresan will be guiding a yoga tour in Marrakech and the Atlas Mountains. 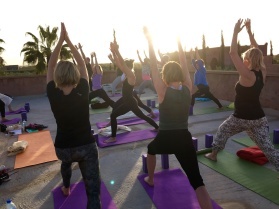 The tour is arranged by Mr Nilsson in collaboration with yoga teacher Tia Jumbe. Want to arrange your own tour? Contact us. Of course you dare go to Morocco! Morocco is the exception, historically, geographically, as well as politically. For articles and analyses regarding the political situation in Morocco. For articles and analyses regarding the political situation in Morocco. Marockoresan has the statutory Kammarkollegiet travel guarantee. Share our home page with your friends! Just klick the Facebook ikon.